On May 1st, I took lots of photos outside Progressive Field, and on May 2nd, I went nuts with my camera inside the stadium. May 3rd — my final game in Cleveland — was simply the day for me to snag an obscene number of baseballs. For some reason, the ushers at this stadium rarely collect the home runs that land in the seats before Gate C opens. Moments later, Grady Sizemore flipped a ball to me in right center. Even though he’s struggling this season, I’ve always liked him and wanted a ball from him, so it felt great to finally get one. My sixth ball of the day was a total fluke. David Huff tossed it into the front row roughly 50 feet to my left — and there wasn’t anybody there. I don’t understand it, but whatever. All that matters is that I was able to run over and pick it up. My seventh ball was thrown by Chris Perez near the visitors’ bullpen down the right field line. My eighth and ninth balls were home runs that I caught on the fly; the first was hit by an Indians righty (no idea who), and the second was a line drive off the bat of Mister Sizemore. It was 5:01pm. The stadium had barely been open for half an hour. I was thinking BIG, but then I hit a bit of a dry spell. Five minutes later, Marcum walked back onto the warning track to retrieve a ball. I wasn’t even going to bother asking him for it, but then at the last second, right before he was about to fire it back toward the bucket, I said, “Hey, Shaun, let’s play catch.” He responded by turning around, tossing me the ball, and then walking away before I had a chance to throw it back. In the photo above, do you see the fan in the pink shirt? He’s right in the center of it, standing in the fourth row. Well, after I caught two more home runs on the fly, I ended up beating him out for another ball that landed in the seats. He was pretty bummed about it, so I asked him if he’d snagged a ball yet. He thanked me, and then he asked if I was Zack. We talked for few minutes and then parted ways temporarily. 1) There was one other guy who also ran up to the second deck. 2) All five balls were scattered in the front row (some in puddles). 3) The other guy took a bad route, and I got a slight head start. 4) I grabbed four of the five balls. 5) I missed one because he shoved me from behind, forcing me to overrun it. 6) I offered him a few choice words. Two minutes before the end of BP, I tried unsuccessfully to get a Jays pitcher to throw a ball up to me. “You got like 30 balls already!” he shouted. “Not quite that many!” I yelled. “Why don’t you dump all the balls out of your backpack and I’ll throw one to you?” he joked. I think it was Josh Roenicke, but I’m not sure. He was wearing warm-up gear over his uniform, and I was 20 feet high, but anyway, while he was jawing at me, another home run ball clanked off a nearby bench. Once again, I hadn’t seen it coming. In fact, it nearly hit me, and it ended up AT MY FEET in left-center. Roenicke (or whoever it was) threw his arms up in disgust. Too funny. And that was it for BP. Finally, there was a moment to relax/breathe. In case you’re wondering, that thing in front of my right ear is a pen. I’d been scribbling notes about all the balls I snagged, and I tucked it into my cap. In the photo above, I’m holding my 20th ball of the day. Jimmy (who took the photo) lent me his glove to use as a barricade so the balls wouldn’t roll down the steps. I suspect that the ball on the left hit the edge of a bench. That’s gotta be how the gash got there. I had met him for the very first time earlier in the day when we were waiting in line outside Gate C — but I had already heard about him because he was involved in this home run controversy last season. Crazy stuff. It turned out that he had heard about me, too, and we kept running into each other throughout the day. I believe he ended up snagging eight balls. The HORIZONTAL arrow is pointing to the spot where I was sitting, the VERTICAL arrow is pointing to me, and the DIAGONAL arrow is pointing to the spot where the ball landed. 1) I was sitting in the second row. 3) …and jump down to the front row. 4) I had to cut left in order to avoid the people and benches. $) The money spot — it’s where the ball landed. If the ball had stayed in the stands, I would’ve been able to count to three and then pick it up. The other fans had NO idea what was happening. But no, of course, because I’m jinxed when it comes to game home runs, the ball smacked off the Road Runner ad, landed in the aisle, and bounced back onto the field. Un-effing-believable. During the break before the start of the ninth inning, I moved to the center field end of the bleachers and tried to get Grady Sizemore to throw me his warm-up ball. He ended up throwing back to Chris Perez, the reliever who was playing catch with him, and Perez threw it to me instead. HA!!! It was my 24th ball of the day — my fourth highest single-game total ever — and Perez was the third player to throw me a pair. Are you hearing me? Three different players each threw me two balls in one day. I know it’s a random/meaningless “accomplishment,” but I’d bet that no one else has ever done it. I took the following photo from the spot where I caught the throw. (I had to jump for it while I was standing on the steps. One of the cameramen yelled, “Nice catch.”) The arrow is pointing to the spot where Perez was standing when he threw it. After the final out, I got robbed by another fan on what would’ve been ball No. 25. Rommie Lewis tossed it to me from the side; the awkward angle enabled some other guy to reach out in front of me, and he apologized profusely. Final score: Zack 24, Blue Jays 5, Indians 1. My Ballhawk Winning Percentage is now .800 (4 wins, 1 loss. ), which means I’d be in first place in any division in the majors. That was it for the Cleveland portion of my trip. I knew that my next stop — Target Field — was going to be a bit more crowded. • 62 balls in 5 games this season = 12.4 balls per game. Wow monsterous game Zack! way to go! Cleveland really does look like snagging paradise and a great ballpark. cant wait to get out there. Another great entry, Zack! I love reading this stuff. The links and the photos and your sense of humor and passion make for an entertaining blog experience. Also, my game high is seven baseballs–I can’t seem to get past that “lucky” number. But I guess it can be done because you hit that mark consistently. By my count you only used the glove trick once at Progressive Field. Was it just the railings and such or did security/ushers take issue with it? Is your book going to have a list of what stadiums allow devices? I’m not a big proponent of snagging via devices (mostly because all the SoCal stadiums frown upon it) but it’s an interesting stat to check out. Where you can and can’t use the glove trick, you know? One word. WOW. What a great day. You definitely set the standard. Today was my birthday. My family had a party for me tonight, so I only attended batting practice and skipped the game. I met up with Rob and John from Anaheim who surprised me by being there today at PETCO. Good to see some fellow SoCal ballhawks. I ended up with three today, but I gave one back to Ishmael because Matt Stairs was throwing it to him and he just missed it. Not a great BP, but just being there is fun to me. Can’t wait to read about Target Field. Have fun…. My high at PETCO is only 7 as well, so don’t feel bad. My high at Qualcomm was 12. More room to run there. Too many railings in PETCO. Hey Zack, How do you haul all those Baseballs around, as well as a Camera and anything else you need? Doesn’t that slow you down? If You have 19 Baseballs in your Backpack how do you move around so quickly? it is crazy how few people go to Indians games, particularly when you consider they once sold out 455 games in a row back in the 90s. Well, it looks like Indians ownership’s loss is Zack Hample’s gain! congrats on the big day. It was nice meeting you (and Jona as well) at tonight’s (5/6) Twins game. Sorry that we weren’t able to hook up later during the game. I’m sure with the rain, you were probably able to make your way down to some decent seats. Bummer of a game, but hope you enjoyed it anyhow. I’ll try to post a panoramic I created that people can play…”Where’s Zack”. 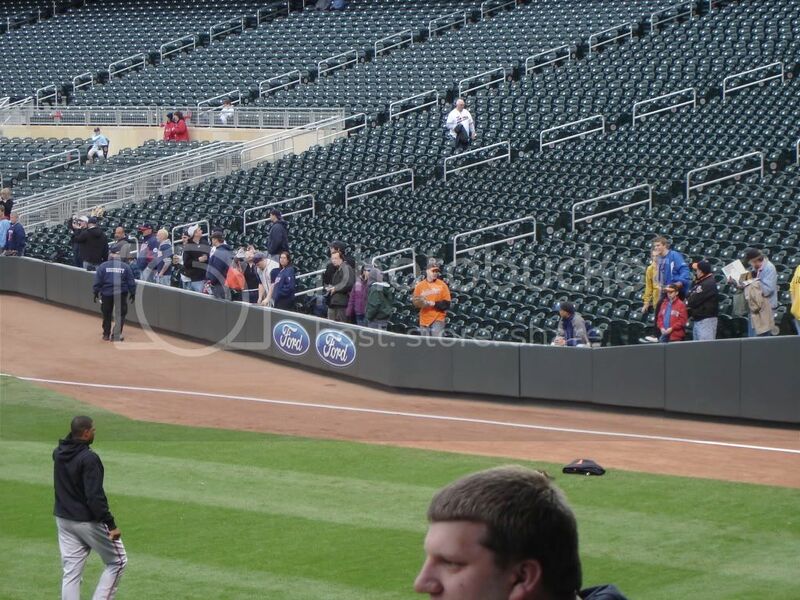 Hey, twibnotes, I’m gonna guess Zack’s near the dugout on the third base side–under the “u” in usbank and what looks to be the Twins’ mascot. I saw a splotch of orange that looked like a Ripken shirt. Yay! Grady is one of my favorite players, so I’m really glad you got a baseball from him. I want to see the Indians but only if they call-up Joe Smith (or they trade him back to the Mets). It is official, Zack, I am ready for a MONSTER BLOG. Bring on Target Field. Thanks, and yes, you really do need to get to Progressive Field soon. The ushers had no problem with it; there just weren’t many opportunities because of the configuration. Happy belated birthday. I miss Qualcomm. It’s tough. It DOES slow me down. I just have to deal with carrying a heavier load. Nice meeting you, too. Rain or no rain, I found it pretty easy to move around Target Field. Nice pics, by the way. Fun stuff. Not sure what else there is to say about the place beyond what’s here on the blog, but if you have any specific questions, I’d be glad to answer them. Meh, I’m not a fan of Joe Smith, but the fact that you like him actually makes me like him a little bit more. Getting all those balls is pretty amazing. At the risk of being that guy, what do you do with all these baseballs? I understand the goal of seeing how many balls you can get but once you have them do you just throw them in a closet? I think the thing the kind of rubs me the wrong way is the asking of players to throw you balls after you have one or a dozen. The orphan balls in the stands or the homeruns/foul balls are fair game but why ask a player for a ball when you already have one. It seems like after you have a dozen someone else in the park would appreciate getting a ball as well. Just my opinion. Your blog is pretty sweet. How many ballparks have you been to? Many of the balls that get tossed to me would not get tossed to ANYone if I weren’t there. As my friend Andrew (who just went to a game with me at Nationals Park) once said, “I’ve seen you manufacture balls.” What he means is that when there seems to be no opportunity to get one, I’ll find a way to convince a player or coach to toss one up. So, you know, even though I catch a ton of balls, I’m really not depriving people of their own opportunities. Also, FYI, I give lots of balls to kids and raise money for charity by doing this. And I’ve been to 48 major league stadiums.